Levis said with visible relief after we’d marked the location of Big Five Tours on Khapta road, explaining to yet another set of curious security guards what we were up to. Clearly, he’d been genuinely afraid after the morning’s workshop. Having run out of batteries almost immediately out of the gate, in both my GPS and my digital camera, I can’t say I fared too well in the trial-run mapping party. But we managed to get a group of Danish students working on climate change advocacy really excited about mapping, and most of them returned with long tracks and careful notation. So far, so good. It’s been a whirlwind week here in Nairobi. As I write, Mikel is making an impromptu presentation of the project for members of Pamoja Trust, one of the most well-known and respected community organizations working in Kibera. And yesterday we spent the whole day at MS ActionAid Kenya, where the Danish students were introduced to mapping techniques along with several others from organizations as diverse as Ushahidi, UNICEF, Umande Trust, and World Bike. We actually walked around with the GPS units in the Westlands neighborhood. This was also great practice for those of us who will be working on the project but aren’t exactly fully versed in the technical aspects of mapping, shall we say. There have been so many helpful yet challenging conversations with groups on the ground here in Nairobi that my head is now spinning. Kipp and Phillip from a group called Sodnet have offered us advice and also precious office space, just out of a sense of cameraderie and shared goals. On Tuesday, we went down to Kibera and trekked around in the mud before we found Carolina for Kibera’s office, where we talked to Kenny about practical details and some practical realities. Out of this conversation, we now have a game plan for recruiting local youth as well as an all-important meeting with the village chiefs next week for their blessing. Around every corner, it seems, is another person offering support and advice, and every time there are unexpected connections that vouch for the shrinking globe. One emerging theme in our discussions with various community organizations and international development folks is that the collection of map data can be perceived in many different ways. We certainly won’t be the first to collect information from the citizens in this highly targeted neighborhood, and even if the data doesn’t require talking to anyone (we’re recording visible features, not demographics), the very process will mean talking to everyone. What is the information being collected for, and what will it bring with it? Usually, such surveying is done in anticipation of a government relocation, or slum upgrading program, or a new water scheme, or a sewage project, or, currently, a plan to move people who live too close to the railroad line. It may be difficult to impart what seems obvious to those who conceived of a project like OpenStreetMap – that it’s by and for the people, it’s unowned, another way to move control of information into the public domain and into public hands. In this vein, we’re involving community groups who work on media and technology here since they have already worked on some of the same goals. Community media – TV, radio, film – has made major inroads through some truly amazing projects like Carolina for Kibera’s work with Flip cameras, local newspaper Kibera Journal, and Pamoja FM’s radio outreach. It’s exciting to see that when it comes to journalism, storytelling and reporting is already in the hands of citizens themselves. If all goes well, we’ll be able to produce some interesting media together. Stay tuned. Having arrived two full days late to Nairobi, we’ve now started to adjust to the new surroundings with the help of our kind host, Adriel, local partner Levis, and Phillip and Kipp from Sodnet, an NGO here in Nairobi that promises to be a great resource for Map Kibera. Thanks to these four, we’ve had quite a pleasant introduction to a city that is known abroad mostly for its crime, traffic, and as an unpleasant but necessary stopover on the way to your safari. So far, I’m more impressed with Nairobi’s greenery, wealth, and ultramodern conveniences than its after-dark dangers, and hopefully it will stay that way. Just a couple of things that surprised me about Nairobi, as a first-time visitor. First off: mobile money. I might have known that mobile banking was well established in Kenya thanks to the Economist article a few weeks back, which I read carefully on the plane. I knew that in Kenya and several other African countries, money could be deposited into your cell phone account and sent via text message to a vendor or individual, who would then be able to access it and cash it out as they like. What I didn’t realize was quite how ubiquitous it would be. I learned that you could send money to almost anyone, including the cop pressing you for a bribe. 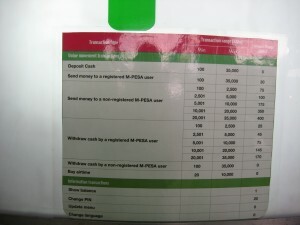 We were even told muggers might demand your M-Pesa account before your wallet. But as soon as you transfer the money, a receipt with the name of the recipient appears on your phone, so wouldn’t that seem to be a hindrance? But convenient, in any case. You can even withdraw mobile money from ATMs. Is this the end of bank branches? The next frontier of finance? Seems like it to me. And my favorite part about it is that it developed naturally as people experimented with sending phone minutes back home via text in lieu of cash remittances. So far, I’m a big fan – and I wonder, why don’t we have this in the US? We’re so backwards with all our “cash” (OK, so I haven’t actually tried this mobile banking thing yet, so I might have to eat my words – we’ll see). What else? The Nakumatt superstores. Now, as opposed to mobile banking, which really has the potential to benefit poorer customers (as a way to safely store and use money without a bank account, for starters), Nakumatt is a brand designed for the wealthier Kenyans. Like a jazzier, more appealing Walmart, Nakumatt stores are enormous and carry nearly everything under the sun. Only, the grocery store is front and center, and the variety and quality of food there is amazing. There are flashy TV screens near the register to “entertain” you in line, and – get this – the place is open 24 hours. Apparently Kenyans will sometimes shop very late at night in order to avoid the horrendous traffic in the city, we were told. I cannot think of a 24-hour everything store that is open all night in New York or anywhere else I’ve lived. Shopping there felt like stepping into the future. Now, all this might belie the fact that we’re staying in a quite posh area known as Hurlingham. Filled with enormous glassy new construction apartment complexes with elaborate security systems and right next to State House Road, tree-lined boulevard of embassies and the abode of the president himself, the area is hardly home to the hoi-polloi. However, more than most “developing country” cities I’ve visited, this type of wealth seems spread around the city and suburbs rather than relegated to one gated enclave. In other words, middle and upper class Kenyans seem to dominate a fair amount of the city. All this provides a certain context, and contrast, to the Kibera slum that we will be working in quite soon. Just after shopping at Nakumatt, grocer to the stars, we drove along the edge of Kibera past tiny corrugated-iron shacks sufficing for storefronts. The same kinds of goods could be bought there that we found at the superstore – vegetables, electronics, housewares, cell phone cards – but the shopping experience could not be more different. I hope that this contrast in culture can be illustrated, hinted at, in our map. It will certainly be on display here on the blog. I guess it takes a great excuse like “I’m headed to Africa and don’t really know what’s next” to actually get a blog up and running. Ah, so many great blogs have originated that way! I had been *meaning* to start up a blog, or maybe start writing again on the one I left behind three years ago…but writing about my day to day life in New York or San Francisco or DC seemed just so very ordinary. I’ll be focusing here on development in Africa, and wherever else my travels may take me. And as a media — shall we say, enthusiast? — as someone who ends up documenting, writing about, recording, filming, and generally analyzing and mediating the world around them in the natural course of living, and thinking about others who do the same, I’ll be writing a fair amount about media here too. This is my current research – to know as much as I can about all the fascinating new developments in journalism, storytelling, communication, and information sharing that are happening here in Africa and throughout the developing world. And to think about how this relates to development as a practice. I hope to write some fun stuff about elephants or whatever, too. I’m not sure what else I’ll cover along the way, but initially I’m going to crosspost on www.mapkibera.org, a project I’m working on in Nairobi with Mikel Maron (who is my partner in most things). The project is to create a map with residents of Kibera, a massive slum in Nairobi, which will be freely available public data afterward, accessible through OpenStreetMap and elsewhere. The whole process of creating the map will be documented here, and also I’ll be looking for the intersections with development goals like empowerment, local ownership and participation, social change, access to resources, and whatever else comes up.